This alarm clock is a great little program. It does everything I need it to do. I tried every alarm clock program since I depend on my phone as my alarm clock and this is the best one. My problems with other ones is that they don't read the MP3 files correctly or they had no snooze, etc. This program has everything. You won't be disappointed. The only improvement I would suggest is a choice of skins. But that is minor and the other alarm programs just did not work. If you are thinking of buying any other program, do a trial. I already lost $9 with one of them because it did not work on my phone. But this one is safe! 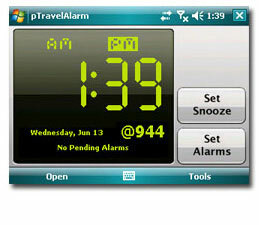 You can download the trial version of pTravelAlarm below. This package will expire 30 days after installation. You can purchase pTravelAlarm for $12.50 US, after which you will receive a registration code to unlock the downloaded version. For Windows Mobile 5 Pocket PC devices, and Windows Mobile 6 Professional & Classic devices. For Windows Mobile 6 Professional & Classic devices. For Windows Mobile 5 Pocket PC devices. For Windows Mobile 5 Smartphone devices and Windows Mobile 6 Standard devices. ***Note: Requires your Smartphone to be application-unlocked. 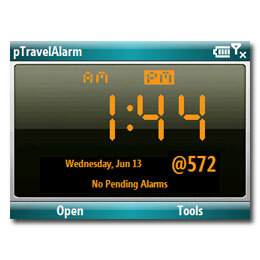 pTravelAlarm is not supported on the Motorola Q9H.